Echo by E-dreamz is our exclusive service and performance-based eCommerce Web Design and Development platform. Throughout our nearly two decades of experience with designing and building high-performing eCommerce and enterprise level corporate websites, we have learned what it takes to style and structure a web application that meets our clients' performance and marketing needs. Echo was designed from the ground-up to deliver fast-performing, secure websites that can be extended, scaled and integrated to meet the unique customization needs of enterprise level big businesses. Echo is the ideal solution for large eCommerce websites, enterprise level corporations with complex web requirements, or niche businesses with unique web systems requirements. Every Echo website is planned, designed, programmed and configured to meet the specifications of each individual business. Echo by E-dreamz, our flagship eCommerce web design platform, has made us the leading eCommerce web design company in the Charlotte region. Utilizing our in-house team of architects, programmers designers, and marketers, we deliver fast-performing, secure eCommerce web design services that are easy and intuitive for our clients to use and administer. All of the code and technology developed to power Echo was driven by the need to provide a consistent, reliable eCommerce web solution that is responsive and mobile-friendly, delivers lightning fast page loads, and comes built-in with all the necessary features for a modern website to generate sales, leads and conversions. The power of Echo is in the team that developed it. We don't sell websites; we form partnerships. Echo comes packed with utilities and features designed to ensure your website performs to modern web standards and can support all your digital marketing initiatives. With built-in support for technical SEO management, intelligently optimized code and caching for fast-loading page speeds, elegant mobile-friendly responsive design, and a bevy of lead-generation and sales tools, Echo is a marketing-first web service solution designed to generate revenue for your business. Our Echo by E-dreamz CMS is a fast, easy and intuitive website administration platform. We pride ourselves on solving unique challenges and developing custom CMS tools designed specifically to meet the needs top-tier, content-rich enterpise websites. And through our Echo service network, we provide the peace of mind of a dedicated support staff, an easy to use CMS, and a fully-managed hosting service that offloads the technical requirements of web support so that you can focus on what matters for your business - your image, your brand and your content. Being a custom-built framework that is exclusively offered and maintained by E-dreamz, Echo has none of the hosting speed & performance issues or common exploits or security flaws that you find with community supported open-source web tools like Wordpress or Magento. Echo is designed to work exactly the way we intend it, with every site running in the same fast, safe and secure hosting environment. Our team of system administrators, database architects and programmers routinely monitor, update and deploy new features and enhancements that ensure Echo remains on the leading edge of web technology speed and security. Fast & Efficient Echo is programmed, designed and tested to deliver your content as quickly and efficiently as possible to your site visitors. With intelligent caching, a fast full-text search, and optimized lightweight code, Echo is primed to perform. In doing so Echo helps drive engagements and onsite conversions supporting all digital marketing efforts. Safe & Secure With no exploitable plugins and extensions or commonly known security holes, Echo is built with your data's safety in mind. Every Echo site includes IP firewall protection for the administrative back-end and runs behind an SSL free of charge. Mobile Friendly & Responsive Echo websites are designed with a mobile-first mentality - your site will scale responsively to display your content seamlessly on mobile, desktop or tablet views. With an on-staff team of topnotch designers, we can tailor your Echo experience with a unique, custom web design. Savvy CMS The Echo content management system is designed for ease of usability but also keeps a web-savvy administrator in mind. From marketing panels, to calls-to-action, to page copy, structured inputs, and customized components - you'll be able to manage everything that your website conveys. Marketing Automation & SEO Suite Echo is a powerful internet marketing tool for your business. With marketing automation tools, social media integration, newsletter and email sign-up functions, full SEO controls and optimization, detailed analytics & reporting, and built-in hooks to support email marketing, Echo will create leads and capture conversions. Configurable Components Echo is configured to meet the specific needs of your business - be it with blogs, photo or video galleries, project portfolios, news or media centers, resource libraries, custom web forms, office locations or map lookup tools, we can create the tools you need to manage your web experience. Managed Hosting DNS, SSL, SQL, Redis, Nagios, Servers, Backups... E-dreamz' dedicated staff has it covered. 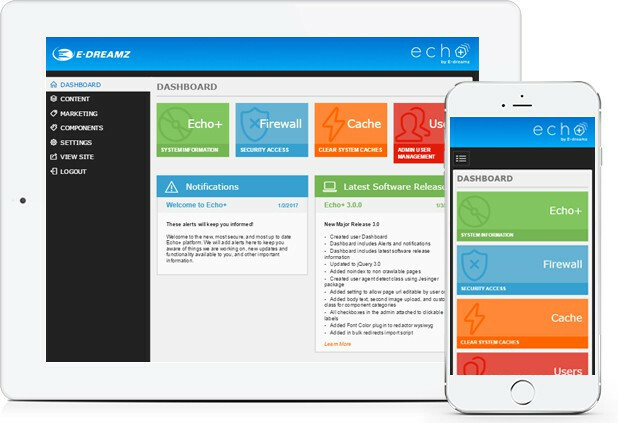 Every Echo site is hosted and managed in-house by our system administration team. We will walk you through the process of launching your Echo site on your domain, and then we'll handle everything from there. Lifetime Updates & Support Echo is supported by E-dreamz, a premier digital development and marketing agency headquartered in Charlotte, NC. Your Echo website will receive continual support from our team of developers and administrators for core security updates for the lifetime of your website. Custom Integrations & APIs Given that Echo was written line-by-line by our staff of architects, programmers and developers, we have full control over extending your website to integrate with any APIs or 3rd party software tools. Whether it's SalesForce, Hubspot, or other ERP or CRM tools, so long as there is an application layer for us to interface with, we can do the work to sync your website data with the software your business uses to succeed. Product Setup & Categorization Echo is your online storefront. With a sophisticated product setup and management area in your CMS, you can style, detail, categorize and price your products with ease and flexibility. And with built-in data import utilities, making bulk pricing changes or important new product lines has never been easier. Customer, Order & Inventory Management Your Echo website is your web store. With a full back-end to manage customers, order histories, customer groups & group pricing, inventory counts and low-stock notifications, and configurable order statuses, payment & shipping options - Echo contains everything you need to run your online eCommerce business. Flexible Promos & Discount Rules With configurable coupon codes, flexible sale pricing, unique pricing for different customer groups, the ability to generate gift certificates, and other promotions & pricing rules, Echo has the tools you need to manage incentives that drive traffic to increase sales and improve your bottom line. Follow-Up Email Marketing Follow up Email is one of the most powerful marketing tools online today. Echo features a fully-integrated follow-up email solution that automates email outreach to your existing customers and also targets potential customers who left abandoned carts to try to re-capture those conversions. Detailed Reporting Echo's reporting section shows you the data you need to make smart decisions for your business. With views and reports for bestsellers, products sold, coupons used, current inventory and stock levels, and various customer and sales order data, you'll have full visibility into your site's success. Multi-Store Support Operate more than one eCommerce storefront that you want to manage from a single administrative area? Echo supports multistore setups that allow you to combine or isolate your products, customers, orders, and other ecommerce data into separate storefronts according your business needs. 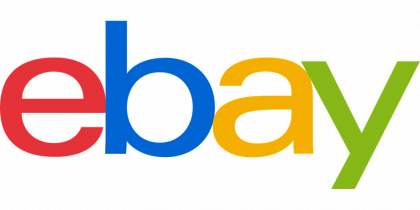 Powerful Elastic Search In the world of ecommerce, search is king. Echo incorporates a fast, powerful Elastic Search with customizable configuration options for type-match and character-match, as well as search-query reporting, to help you fine-tune your search results to best deliver relevant products for your customers' queries. Secure Payment Options Echo integrates with PCI Compliant payment providers to ensure your customers' payment and transaction data is properly secured and transmitted. By partnering with Stripe, PayPal, and HostedPCI, Echo can work with your business to integrate the appropriate payment solution for you and your customers. Customized Shipping Options Echo pulls pricing from all of the top shipping services like USPS, FedEx, and UPS. The system also has common shipping rules built in that accommodate flat rates, free shipping, table rates, and more. Our development team even has the ability to tailor custom shipping rules that are unique to your individual company's needs.